Father John "Jack" Smyth, a Redemptorist missionary who spent 20 years in Brazil, died November 3 at the St. John Neumann Residence at Stella Maris in Timonium, MD. He was 73. Click here for a complete obituary. A funeral Mass will be celebrated November 7 at 2 p.m. in the main chapel at Stella Maris, 2300 Dulaney Valley Rd., Timonium, MD. A viewing will be held November 8 from 5 to 7 p.m. at Sacred Heart Church, 998 Father Donlan Dr., New Smyrna Beach, FL. A wake service will be held at 7 p.m.
A funeral Mass will be held Wednesday, November 9 at 11 a.m. at Sacred Heart. Burial will follow at Edgewater Cemetery. Father Smyth was born March 13, 1938 in Pittsburgh, PA. He professed first vows as a Redemptorist on August 2, 1959, and was ordained to the priesthood June 21, 1964. After returning to the United States from Brazil in 1984, Father Smyth’s assignments included Immaculate Conception Parish in the Bronx, NY; Mount St. Alphonsus Retreat Center in Esopus, NY; and various assignments in the Vice Province of Richmond, including Hilton Head, NC; Griffin, GA; and Venice, FL. He also served as second vice-provincial consultor and as vice provincial vicar. 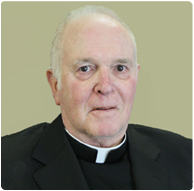 Please pray for Father Smyth, and for his family, friends, and Redemptorist confreres who mourn his loss.